We've been getting a few questions about following our Viwawa Blog and Twitter accounts, and we hope this post will clarify the issues. 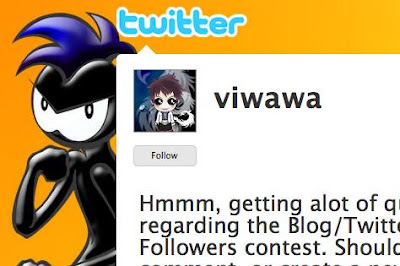 You need to create a Twitter account (if you do not have one), then go to our Viwawa Twitter account at http://twitter.com/viwawa. You should see the 'Follow' button on the page, as shown below. Click it and you're following us! 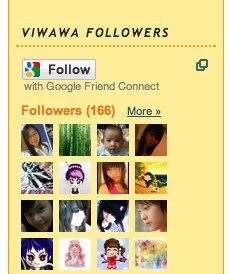 You can go to our blog at http://blog.viwawa.com, and you would be able to see our 'Viwawa Followers' panel on the right. Click on the 'Follow' button and perform the required steps from Blogger, and you're done! Every week, one lucky follower will be randomly chosen from this whole group of blog and Twitter followers, and 100 Viwawa Cash will be allocated to the Viwawa account. Tweet the Viwawa profile together with '@viwawa', so we can see your reply. Update the profile with the Viwawa profile. how u mean like "Tweet the Viwawa profile together with '@viwawa', so we can see your reply"
Is it mean like we type a words then must put @viwawa at the end? You can put the @viwawa anywhere in the tweet and it can be easily read by us. You can go to our post http://blog.viwawa.com/2009/05/tweet-tweet-viwawas-on-twitter.html to see the 2 links about Twittering.